Based on the data published by one of the biggest OEM’s in the world, predictive analytics of equipment reduces downtime by 70%, Extends life time by 30% and reduces energy consumption by 10%. Looking at the spread of the electrical assets in a commercial or an industrial setup, motor comprises of 80% load. The next major electrical asset is the Transformers. Mostly everything else is an application of motors, like compressors, chillers, generators, etc. 95% of industrial and commercial setup follow planned maintenance programs using tools like SAP, Maximo, Oracle, etc. 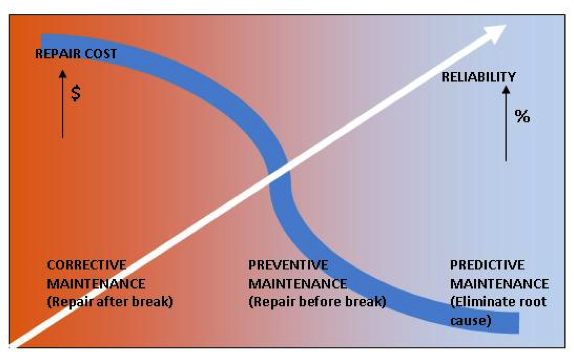 Predictive maintenance means the decision to carry out maintenance program is based on data and not on log sheets, ERP’s, OEM’s or your energy consultant’s recommendations. The Picture is self-explanatory. Most of the time, unscheduled maintenance will be taken up if we visually see a fault or the noise level of the equipment increases. The problem would have started way before. The more an equipment is repaired, the less reliable it becomes, this being the main reason to enter into comprehensive maintenance contracts with our vendors. Equipment’s, which are repaired multiple times, are more prone to failure; this increases the probability of unscheduled downtime, which has a huge impact on production. It does not warrant any discussion to prove that if the asset are maintained / repaired at the right time, the life of the asset increases. This ensures optimised capital deployment. The key to any business is cash deployment, whether it’s keeping spares or investing in replacement. The longer the assets run optimally, the better capital utilization, which, means better profitability for the business. A $500 equipment which can be optimally run for 5 years, failing in the 3rd year would entail capital deployment as well as increased operational expenditure. 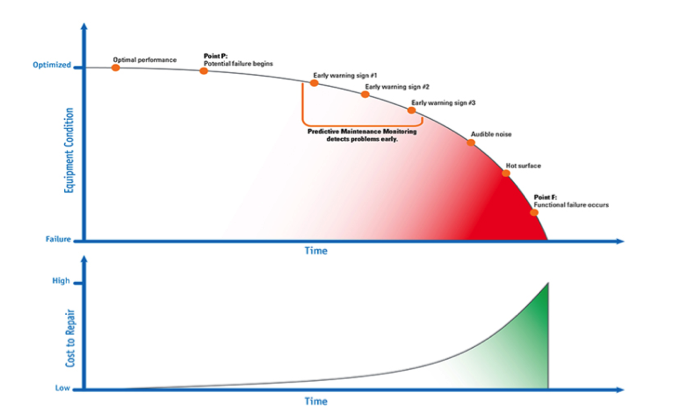 An Asset starts to consume more energy than it should in one or both the phases as below. Degrading Phase — As the machine degrades, it starts to consume more energy. The sooner the decision to carry out repairs, lesser the losses. Post Repairs Phase — with one of our Pharma customer, we have seen that a motor, once gone through a rewinding process, started to consume double the energy. Perhaps it would be prudent to take a decision if it’s really worth getting the motor repaired or replaced. Most of the time energy inefficiency becomes secondary, the plants needs to run at whatever cost. The path to predictive maintenance is now possible with IIoT platform’s and digital twin creation on the IIoT platforms. Instead of replacement of the entire piece of equipment due to critical failure, a repair is made prior to failure and cost is minimised to the price of the component and the labour needed for the repair. When repairs are scheduled, the amount of time needed for repair is reduced because of a smaller number of component replacements instead of entire equipment replacement. Also, the frequency of repair for critical failure of equipment will be reduced and the amount of “critical callouts” will be greatly reduced. Component only replacement is scheduled with production to take place during scheduled downtime. Unscheduled downtime may cost thousands of dollars per hour. A proactive maintenance department can head off critical failure downtime by scheduling repair during non-productive times. Predictive maintenance would allow potential problems to be fixed before failure occurs, which would create safer conditions for employees and customers. With less maintenance on good components and quicker repair of faulty components, repairs can be more effectively handled, thereby reducing repair time.